This is a healthy and hearty vegan and gluten-free chili. It can be whipped up in under an hour although I recommend letting it simmer longer, because chili only gets better the longer the flavors have to get to know each other. I considered taking more photos while cooking this dish but I wasn't sure if it would turn out all that good and, at the time, thought to myself, "if it turns out to be delicious I will just make it again and do a better job at documenting the process." Well, it turned out quite tasty and I didn't want to wait to share it. So there you go, that photo above is all you get. 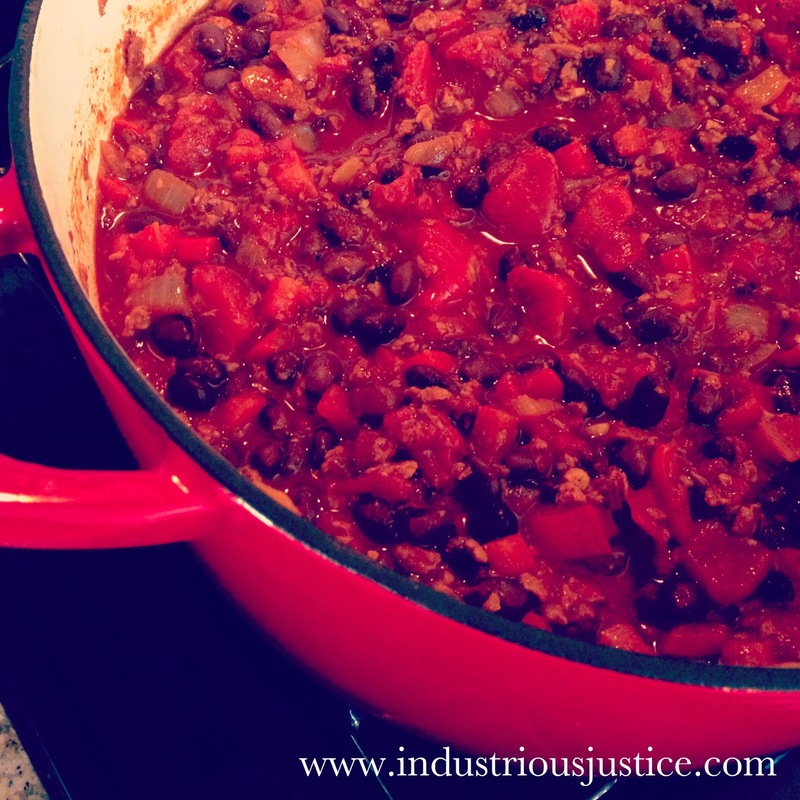 We served this chili for a dinner and game night as part of a baked potato bar. In addition to the baked potatoes and chili, we laid out various toppings for our guests to choose from, including: diced avocado, crumbled bacon, shredded cheddar and pepperjack cheeses, light sour cream, salsa, hot sauces, corn "scoop" chips, and chopped green onions and chives. Heat oil in a large dutch oven or pot over medium heat. Add onion and bell peppers and cook, stirring occasionally until softened and the onions are beginning to brown, approximately 10 minutes. Stir in the minced garlic and cook for 30 seconds, until nice and fragrant. Remove the chorizo from the casing and crumble into pot. Cook, stirring often, until heated through, approximately 5 minutes. Add chili powder, cumin, paprika, black beans, diced tomatoes, and vegetable broth (amount of broth depends on your desired chili thickness). Stir to combine and bring to a simmer. Simmer uncovered for at least 20 - 30 minutes to combine flavors. Salt and pepper to taste. Serve with your favorite chili toppings. I highly recommend diced avocado and fresh herbs. Vamos a ir a Cuba!